Timothy Ely was born in the Snohomish General Hospital in 1949. Truman was president. On the site of the hospital now stands the new version of The Snohomish Public Library. Tim became a voracious reader at a young age. A sympathetic teacher [who also taught him to draw] would lead him often back into that public library [a fine old Carnegie building] where tales of pirates, Tesla coils, maps, flying saucers and back issues of Scientific American and Popular Mechanics would begin to tarnish the goals set for him by the rest of the family. In this library he began to explore images in the worlds of science fiction and comic books. Following high school and tenure in several local area rock bands, Ely enrolled at Everett Community College following luminaries such as Chuck Close and Donn Trethewey by several years. This was just after the summer of love  and a time of extraordinary fertility in painting. Ely was perfectly placed. With painting a primary interest and an awareness that design was the grounding language, Ely pursued a degree in fine art. A number of chance remarks by teachers began to gradually orient Ely towards the inherent duality in the forms of the book. There were no opportunities for study in that area, but the pull of the idea of the book as as aesthetic carrier was a potent and inspiring image. Following graduate school [MFA Design 1975] Ely began a self-motivated study of bookbinding. 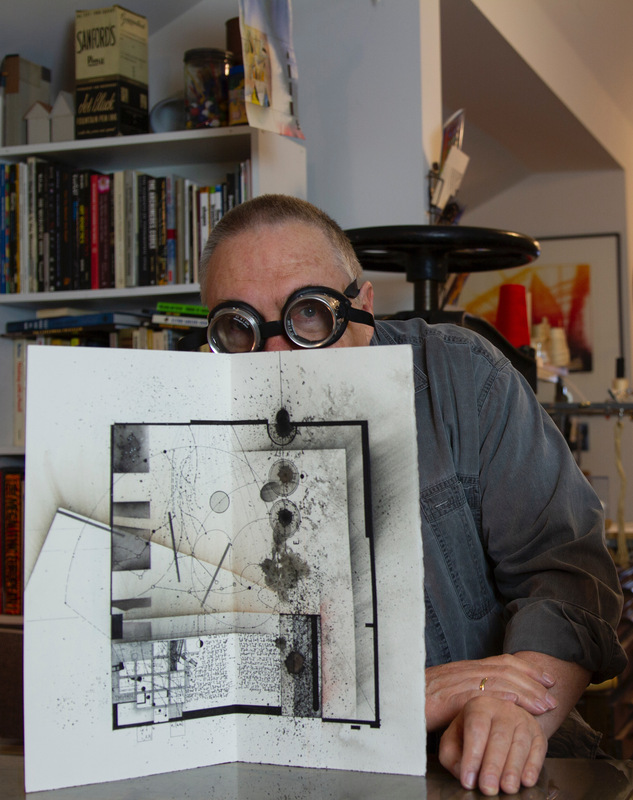 He began to fabricate the work he is known for today, a fusion of largely English-style binding techniques with visionary drawings of an unknowable future. He has received numerous awards. With an NEA grant  he traveled to Japan, Italy and England, studying bookbinding and papermaking. Following this he moved to New York, where he established a studio and also taught at the Center for Book Arts. During this decade in New York, he traveled to Europe, Central America and Scandinavia lecturing, exhibiting and teaching. He has had numerous solos exhibitions and has participated in many group exhibitions. His two most recent exhibitions were at the Jundt Museum of Art and The Northwest Museum of Art and Culture. His work is collected planet wide and is held in public, private and secret collections. Tim currently lives in Eastern Washington near the Colfax River. He is represented by Lux Mentis Booksellers in Portland, ME. For more information, visit www.TimothyEly.com. My Artist’s Journey. Part 1. Though nearly born in New Jersey, Doug Garnett’s family returned to their home country in time for him to be born at the foot of the Rocky Mountains and raised in Boulder, Colorado. Professionally, he started in music, received degrees in mathematics, studied english history and soviet science fiction along the way and adventured in the 1980s aerospace industry of Southern California. Working on rockets and the Space Shuttle weren’t enough — so Doug moved to marketing and sales where he has sold supercomputers, marketed all types of consumer products, and even directed national television commercials. Along the way, Doug studied drawing and painting to explore the visual side of life. Now living in Portland, Oregon, Doug and Tim connected in the 1990s through Doug’s wife — artist Judith Quinn Garnett — when she studied with, and assisted, Tim in his studio classes. Just over a year ago, Doug started developing a documentary about Tim Ely’s work (more on this project in the future). One thing led to another and Doug helped resurrect Tim’s long-defunct blog. Part editor and part co-conspirator (assisted greatly through proofreading support from Randall Hankins), Doug and Tim conspire on the posts for the blog. Doug closed his ad agency a year ago to focus on the marketing of innovative new products through teaching, writing, consulting, and a few ad campaigns. His new company is Protonik, LLC. In addition to working with this blog, Doug’s musings about innovation, marketing, and technology can be found on his own marketing blog.